Had a quiet 30 minutes last night of digging through the AH and found some real bargains. 9g for a level 40 epic, Bargin! I found a Signet of the Accord (ilevel 200 epic Tanking ring) for around 120g, a Durable Nerubhide Cape ( ilevel 200 epic Tanking Cloak) for just over 200g, both which will go to my Paladin when he hits 80. Also found a set of Boots of Avoidance, which are a groovy set of Tanking boots for my lowbie Warrior Tank for a staggering 9g. So a nice night for buyers of Tank gear on the AH. It is funny to consider that the enchants for some of these items will probably cost 30-40% of the buy price of the item. I’ve also got another really swanky cloak and boots with bids, but I really doubt that I’ll win given how often the AJ is farmed by folks. I don’t use the AH for cash generation most days, more to periodically look for great deals on gear I might want. Was stoked to get that gear last night for my Paladin. Are 226 legs worth 200g, or did I just overspend? 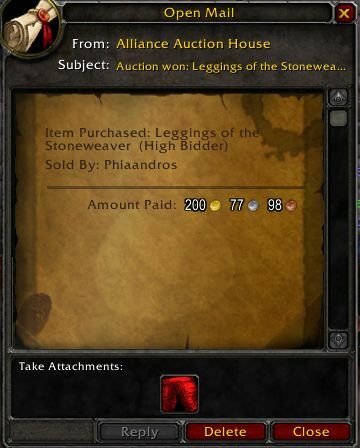 Also made out ok just after that with a little purchase that I’ll try to resell, a Leggings of the Stoneweaver, which is 226 ilevel Shaman gear, for 200g. 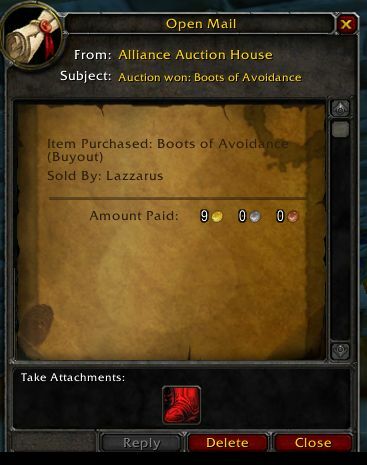 I think this AH scanning thing could have some merit, and although I do most of my searches “by hand” and pick bargains – this could put me a lot closer to grabbing some silly gear for alts. Perhaps work toward a 6th toon with epic flying.